Located in the northern part of Spain, La Rioja is one of the country’s most well-known wine regions. Visiting Rioja wineries is a special treat for wine lovers, especially if you can go in the fall when the leaves are changing in the vineyard. The views over the vines are second to known, and there are many wineries in the area who welcome visitors with big smiles and open cellar doors. If you already know a bit about Rioja, then it won’t surprise you that Tempranillo and Granacha grapes grow abundantly there, leading to the bright, fruit-forward wines that are typical of La Rioja. Additionally, the Graciano and Mazuelo grapes are used in many of the wines of Rioja. One of the things we love so much about this region is that the grapes varietals are different than the usual suspects. That makes each tasting exciting and new, as you discover the flavors of these unique grapes. The region’s wine-making tradition spans back to Roman times. While the practices have evolved with modern machines and conveniences, you can still feel the ages-old history of wine making in the cellars of Rioja. Many cellars in the area are built deep under the city, with long corridors of underground caves. It’s a sight to see, especially when you glimpse a tall stack of bottles that have been aging in the cellar for decades and are now growing mounds of mold. RELATED: If you’re a wine lover (and who isn’t, really? ), check out these other top destinations for wine tasting around the world. Like this post? Why not pin the images below on your Pinterest board to share with friends? Rioja was the first region in Spain to be awarded DO (Denominación de Origen) status in 1970. La Rioja is divided into three zones: Rioja Alta, Rioja Baja and Rioja Alavesa. Since each vineyard plot is so small, many wineries blend grapes from each of these areas into their wines. Single-region wines are best at showing the differences in terroir of each of the three regions. You’ll find a few different selections of wine from Rioja, starting with Joven (young wine that has been aged for less than a year in oak), Crianza (which has typically been aged for two years – at least one in oak), and Gran Reserva (which has been aged the longest – at least two years in oak and 3 years in bottle – and is the best expression of the winery. Rioja wines are ready to drink when purchased, unlike wine from other areas that require more aging in the bottle to be drinkable. You always need a reservation to visit Rioja wineries. Plan to make a reservation at least a day or two in advance, or longer during slow periods, like around the holidays. You can make a reservation by calling or emailing the winery. Some also have online forms you can fill out with your request. Another way to make your winery plans is to ask the concierge at the hotel where you’re staying to make the plans for you. When you visit a bodega in Rioja, you can expect to take a tour of the facilities, which lasts about an hour, followed by a wine tasting of their chosen wines. All in, you can expect to spend about 2 hours at each winery. For this reason, you can only make it to a maximum of 3-4 wineries per day, depending on how serious you want to be about it. You have to factor in plenty of time for driving between wineries, as well. Rarely do bodegas offer a tasting-only option, where you can just stop in and taste their wines, but there are a few in case you don’t want to go on a bunch of winery tours. In Haro, wineries like Muga, Roda and Cune all offer a drop in option for tasting. Their cellars are very old and fascinating, so I suggest doing a tour of at least one of those wineries, but if you don’t have time or just want to taste some of their wines, you can just pop in. Rioja is a large wine region and it’s split up into smaller growing zones called Alta, Baja and Alavesa. There are bodegas of interest to wine tourists in each of these areas, but most tourists tend to center themselves in Alavesa. When you get there, you likely won’t be able to tell the regions apart from each other anyway, so don’t worry too much about what region you’re in. It is relatively easy to plan your own self-guided wine tour of Rioja. You will need to rent a car and drive yourself around (sip and spit! ), but the roads are very good and easy to navigate. Google maps worked great to get us from place to place without getting lost. In many cases, you can even pick an area to tour that has many wineries clustered together so you don’t have to do much driving. However, if you don’t want to plan your own trip, or do the driving yourself, then an organized Rioja wine tour might be the way to go. I do think that many of the Rioja tours are overpriced. You can do the same thing yourself for so much cheaper, but if you don’t mind spending the money for the convenience, then by all means. You can look through the options offered through Viator (a company I really like working with – they make booking tours very easy). Or go through a company like Rioja Wine Trips or Wine Tours Rioja, who can personalize tours for you. Which one you choose depends highly on what you want to get out of it, how long you have and where you’re staying. Now, let’s get down to it. Which wineries (bodegas) should you visit in Rioja? I like to clump together the wineries into easy-to-visit clusters. In Rioja, it’s simple to do this, and you can save yourself a lot of driving if you do. Here are some suggestions for where to taste wine in Rioja. As I previously mentioned, there are a lot of wineries in Haro (the capital of Rioja wine). You can park your car at the parking lot near CVNE, and then walk around to the various wineries. They are within easy walking distance of each other. The small medieval town of Laguardia is located up on a hill in Rioja Alava. If you like walking around interesting towns, you must stop there. Great places to eat lunch, too! For the wineries around Laguardia, you can’t walk between, but you only need about 10 minutes to get between them. A great place to base yourself while visiting La Rioja is the city of Logrono. It’s has a lot of amenities for travelers, so you’re sure to find plenty of places to eat and drinks. We LOVE the pinchos crawl – which takes place at lunch and dinner every day on Calle Laurel. As long as you have a car, you can easily drive from Logrono to the other areas where there are clusters of wineries. We highly recommend the Hotel Calle Mayor, if you’re looking for somewhere great to stay in Logrono. There are a few bodegas that are not clustered with others that I think are great to visit. You can maybe put them into Google Maps and see which cluster you want to add them too, or just visit them on a separate day. 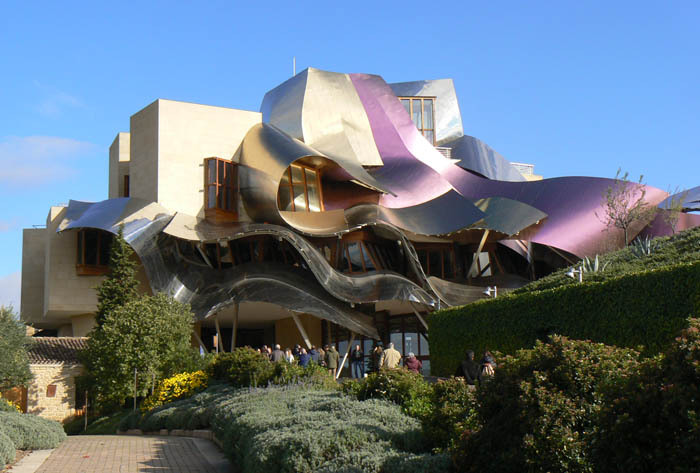 Bodegas Marques De Riscal in Elciego – this is where you’ll find the fantastic hotel designed by legendary architect Frank Gehry. Great place to stay (if expensive). And they also have a 1-star Michelin restaurant on sight. Bodegas Vivanco – this winery is actually a foundation that offers many different experiences on sight. They have a wine museum that is very much worth a visit. They have a restaurant that serves fantastic food – even wine pairing lunches. It can take quite a bit of time to visit the winery, have lunch and see the museum, so be prepared. With all of these recommendations, you should stay busy visiting Rioja wineries for many days! If you have any other questions about the area, let us know. We’re happy to help!